Imagine borrowing any type of wine or drinking glass (empty or not) and covering it with a cloth napkin or borrowed dish towel, and the glass begins to float in an incredibly magical way... Then, imagine while it is floating, your spectator is able to hold the napkin along with you as it magically lands onto the spectator's hand and the cloth is removed to conclude the routine. If you could do this in almost any real world situation, that would be truly incredible, wouldn't it? In fact, that would be Exquisite. The result is incredible. In many ways, it's like putting all the power of the Floating Table into your pocket for an impromptu performance! 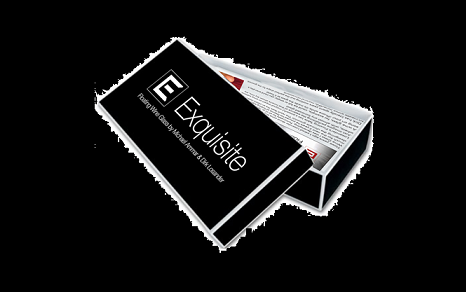 Exquisite has been in secret development for several years. Three prior versions were almost good enough, but after 3 years of development on this 4th generation model, Dirk Losander cracked the final code for hooking and unhooking the glass (with the most simple method) by using a completely different process from all of my previous attempts. The result is incredible. In many ways, it's like putting all the power of the Floating Table into your pocket for an impromptu performance!